Everytime I find a pair of shoes that I totally adore and must have but can't afford, my little heart totally sinks and it’s as bad a feeling as a breakup with someone after years of dating them. I am NOT kidding…. I take my shoes so seriously, it has to be classified as a relationship. I even wear my shoes in rotation so that one pair doesn’t feel left out just coz I wore the other ones 2 times more. But when that unaffordable pair comes on sale and I can finally afford them, its like I have died and gone to heaven!! I had gone to Topshop atleast 4 times to try these gold entities before they finally came on sale a few weeks ago and then I just couldn’t resist and finally bought them home, where they belong. So Excited!! This dress was also one of those obsessive attractions of my life. I saw this dress, obsessed over it for about a week and then due to complete lack of sleep it caused, I had to collect all of my pennies in savings and buy it. Did not regret my decision. 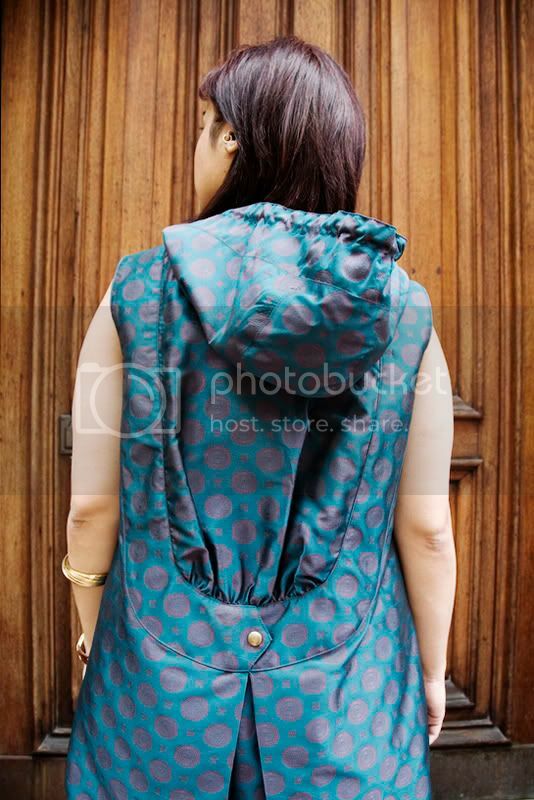 Tail coat detail on the back, a hoodie, rich fabric, beautiful colors and quirkiness all over. It was so me that it would have been a crime if I hadn’t adopted it. I heart Anna Sui too BTW. Saw Jack Johnson in concert last week, saw Inception last night, ran 7 miles on Saturday, shot a fabulous shoot today with Anjali for next week’s post, and a million other little things happened along the way. All in all Life is Good! What have you guys been upto lately? OMG!!!!! your Wedges darla.... SUPERB!!!! this is amazing outfit, u look gorgeous! Oh man, those are some SHOES!! 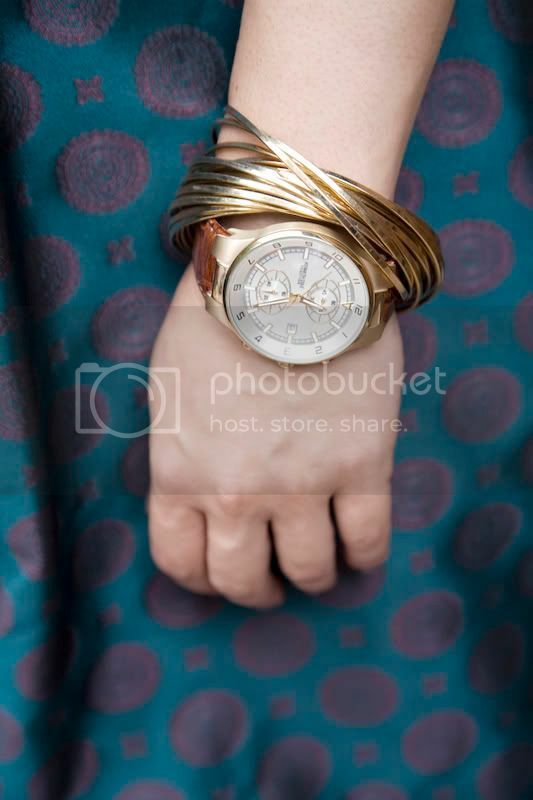 That watch is gorgeous too. You can just feel that it exists on another level. Holy crap the shoes.... holy crap... ok.. so totally you.. I can see that.. but still.. the shoes. LOVE the outfit - the dress is stunning! really nice outfit, i like particularly shoes but even the dress look beautiful!!!! stunning shoes!! are they comfy?? @bollywoodstylediaries...yes they r... they r like 6-7 inches high but for a height like that they seriously are comfy!! i cant wait for the next ashish shoe for topshop..i think this ashish designer and i are totally MFEO [not saying just coz i know he's indian..i swear]...i think he totally designs these shoes just for me!!!! I LOVE HIS WORK!! @gary: anything that brings to u nyc hunny...i am freaking dying to see u!!! Those shoes may be the most awesome shoes I've ever laid my eyes upon! I adore your entire outfit. You nailed those gold leaf shoes in my opinion! Looking good. I am now following you as well. Your outfit is great! Amazing shoes! wowoie...!!! and the gold staircase... nailed it! Home run with this look. You nailed those gold leaf shoes. One of the beast looks so far in your personal fashion series. OMG, these are some crazy shoes!!! after years of loving silver now I have started to appreciate gold more and more :) and I love all your golden accessories, so stylish! Prutha honey.... you are killing me. KILLING me with the total and utter awesomeness of this outfit. LOVE the shoes (faint)! ...and you look ahhhhmazing!! Life is good and you certainly look it! Oooooh, what a great dress! Dress and shoes are just gorgeous! I love the rich colors. The print and colors of the dress remind me of a sari for some reason. Good buys! Dude you are ridiculously good. I mean I can't comment on each and every one of your posts and stammer the same compliments now, can I? You are out doing yourself consistently. Lusts. Lusts. Lusts. That dress is giving me goosebumps. Now off to drink some water, I am salivating myself to dehydration. Adios! Ugggghhh Prutha I died by such fabulousness!!! You are totally pulling those shoes off soooo effing well! Love the dress! You look fabulous! I like your style, always simple and nice with the right accessories! :) Love these Shoes! am so thankful to u for inviting me here to your blog. You have a great fashion sense and this post was really awesome..I have fallen in love with your sweeeet 'Nestle' ring and it will stay embedded in my memory for long.. I very much enjoyed your other posts too..
want that dress!! so lovely..